It may surprise you to learn that TOA has been manufacturing wireless microphones since 1964 (that’s way longer than most currently popular wireless mic manufacturers). We’ve even been the technology supplier for other wireless manufacturers. Needless to say, TOA has a lot of experience when it comes to wireless mics. The 5000 Series represents the latest permutation of that experience. So, what’s so special about the 5000 Series? First and foremost (and this is where TOAs long experience comes in) is the very robust UHF transmission & reception system employed by the 5000 Series. TOA uses 3-stage filtering to help reduce the impact of interfering signals. These filters create a tighter “window” to allow only the desired signals through, while undesired signals are more effectively locked out. Second, the TOA mics (both hand-held and body-pack) are designed to be extremely efficient (over 10 hrs of operation with a single AA battery) and are extremely lightweight and ergonomic (not big, heavy paperweights). We even provide an anti-roll guard on the hand-held mic body to prevent them from rolling off a table. The 5000 Series mics are also equipped with charging contacts and are compatible with the optional NiMH batteries and charging system, which eliminates the need to continually replace batteries and assures that your wireless system is always ready to perform. Lastly, the 5000 Series squeezes lots of performance and features into a cost-competitive package. These include features not often found on similarly-priced systems such as frequency-scanning, antenna daisy-chain ports* and comprehensive LCD displays, as well as the ability to operate up to 16 simultaneous systems. And, to help cope with the ever changing UHF spectrum landscape, the 5000 Series models are available on frequencies from 576mHz to 698mHz, so you’ll always find a place to work that’s free from interference. 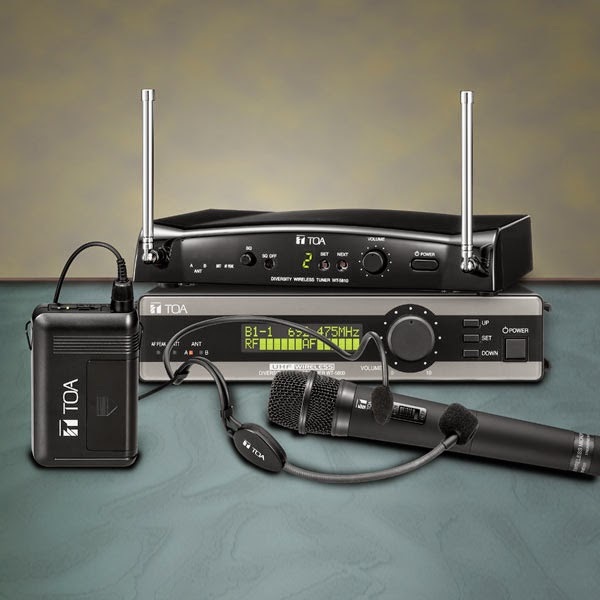 TOA offers a range of transmitters from hand-held (WM-5225, WM-5265 & WM-5270) to body-pack (WM-5325 with a choice of microphones) as well as Tuners (WT-5800, WT-5805 & WT-5810, plus the modular WTU-4800/WT-4820 system. Add all the necessary options (remote antennas, mics, distributors, etc…) and you’ve got a complete wireless solution that works for just about any situation. If that’s not enough, TOA protects your investment with a 5 year audio warranty (more than any other wireless manufacturer). For more information, visit out website by clicking here. Also, check our handy Wireless System Configuration Guide, which will help you choose the system that suits your needs by clicking here.